An issue exploring iconoclasts, tensions, contrasts, antagonisms, and culture clashes that motivate art and inform conflict. This is an issue exploring duels. I therefore give you back your freedom as of September 1, 1959. He was their fascination, danger, and distraction, a foretold scapegoat, a matter of time. They say difficulty is an invitation; does that mean the more the difficulty, the more the invitation? Is impossibility the deepest invitation of all? The first thing he wanted to do was to leave, no, it wasn’t—why are you lying to yourself, Costumier? Rejoice! Our times are intolerable. Take courage, for the worst is a harbinger of the best. Writing, as long as it is one’s private freedom, will always be disloyalty. We are in obscene danger of becoming mass men (all right mass “people”) whowill attempt to teardown anyone who is beyond us. How do two artists live together… and maintain our sanity and continue to work? The streets were always so full of people running around all over the place, this way and that, shouting out "Free-dom! Free-dom!" What was the point of so much effort, single-minded devotion, celibacy and sacrifice? She says I’m always doing bad things, and maybe she’s right, but if I don’t do them I get bored. There were too many of them in the small house, and the rain was constant that last day. During this time I was enjoying the passage of days and waiting to see if there would be any money. O you gorgeous torture, you slow-mo sadist, / you taught me all I knew about breathlessness. How many men fit into this ditch / beside me? What color before were / my robes? Someone will lose both eyes. In my dreams I'm heading home. I'll be a sleuth rummaging through missing clues. Do you realize the wealth of stones / God, in His infinite wisdom, has given to this township? Because I have no language / for fire, I say longing. The low light of the lobby spreads out like a day. Even more than the streets, the harbor is liminal by definition: the tides only change. The workers of the world (except at lunch hour and on the weekend and except parents and those who care for children) don’t sit in parks. The tipi, for instance, understands plains life far differently than the barn. Surface is not an independent element. It has thickness, and this thickness is both physical and metaphorical. Asking questions can lead to trouble. Asking questions can be a very bad idea. He saw the ice growing up from the dirt, the browning of the grass. The ascendance of the callous season. We talked of grabbing the city, as if by its neck, and having it right here, right in the palms of our hands. All that mattered then for a musafir from America was how he was going to go about killing another hot summer day. Get A Public Space as you like it: the print magazine, the digital version, or a print and digital bundle. The best value? 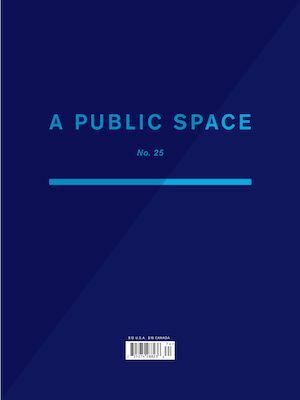 Subscribe to A Public Space and receive three new issues of the magazine as well as exclusive access to the online archive.